I absolutely love spring! Flowers are blooming, gardens get planted and that means fresh veggies and canning season right around the corner. 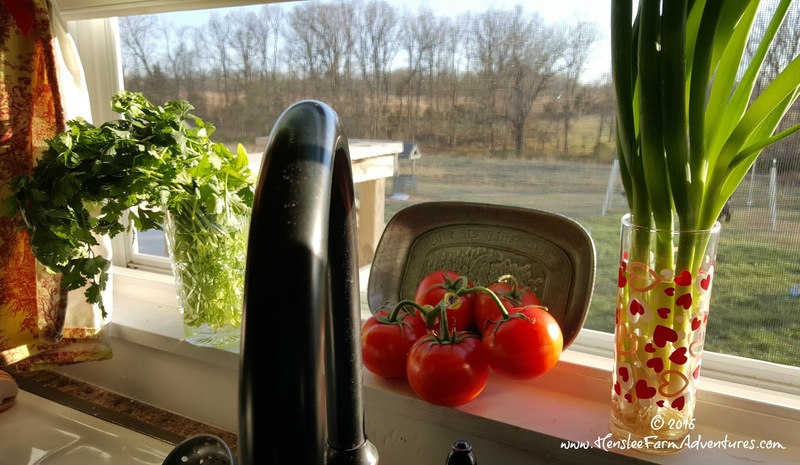 I can't wait until the produce I have on my window ledge actually comes from my garden! We are getting our garden beds ready to plant. I am glad that I have held off because we have had some hard freezes still yet in our area. However I believe that we are ready to go ahead and plant some veggies. In the past we have always tilled a big 40 foot by 60 foot plot and planted, but we had so much rain last year, that nothing grew, except a pond of course! 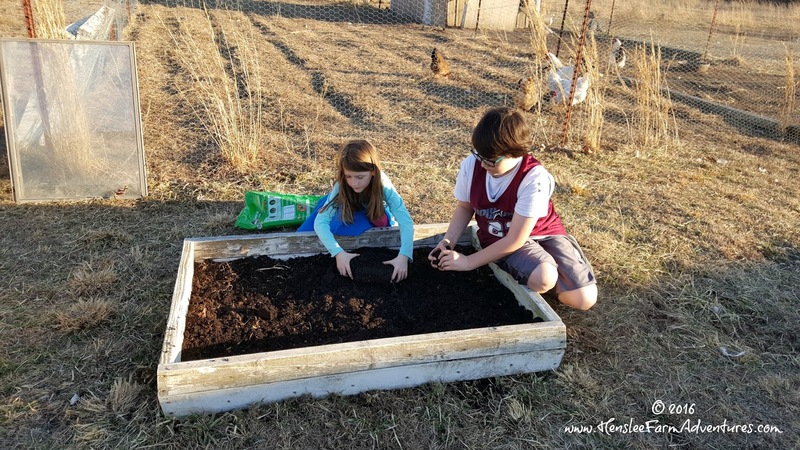 ;-) That is when we decided to make raised garden beds (you can read about how we made them HERE). This year there isn't much to do to get them ready except add a little soil. And the exciting thing is that while we did have to buy some soil this year, next year we won't have to. We should have enough compost to add to our garden beds, and after all that is what we are striving to do, to become self-sufficient. So I thought I would share some pictures with you about how we are getting ready on the farm for our garden. The pictures below only show one of our garden beds. We currently have three and will be adding more this summer. 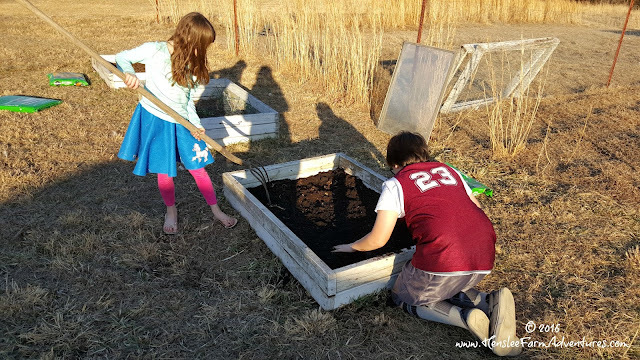 I can't stress how important it is to let your kids help with the gardening. 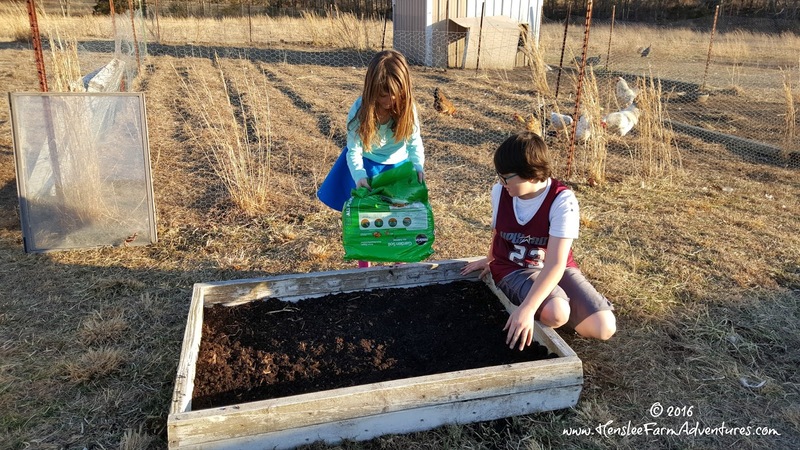 We have to teach our younger generation where food comes from, good nutrition from fresh veggies, and how they can feed themselves as they get older. I am so glad to see that gardening and canning are making a comeback, because it is an art that should never be lost! But Mom, we have to spread the dirt around with our hands! I can't blame them, I love getting my hands and bare feet in fresh soil. There is nothing that feels better. The soil we bought did end up with a lot of clumps, so getting them out was a job that my kids loved! Here they are leveling out the soil. Next come the seeds. My dear friend Amy gave me some wonderful seeds that she had and wasn't going to use. 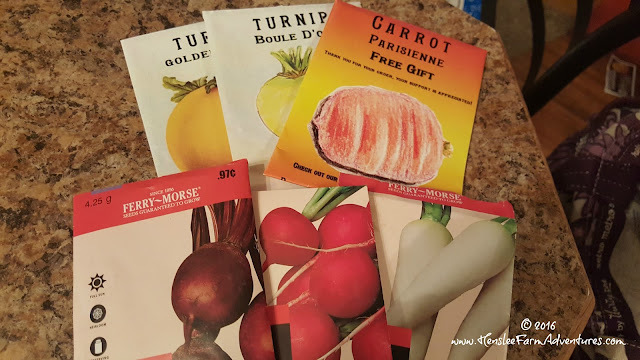 It was like Christmas and my birthday all wrapped up into one looking through those seed packets. I was trying to figure out which ones to plant, there were just so many to choose from! Some of the seeds I will plant. I have not had good luck with carrots in the past, but each year I keep trying and I am bound and determined to grow some, someday. I really think our soil is just too rocky, but hopefully with the raised beds, that will help the situation. I also thought I would share a couple of pictures that to me mean springtime. 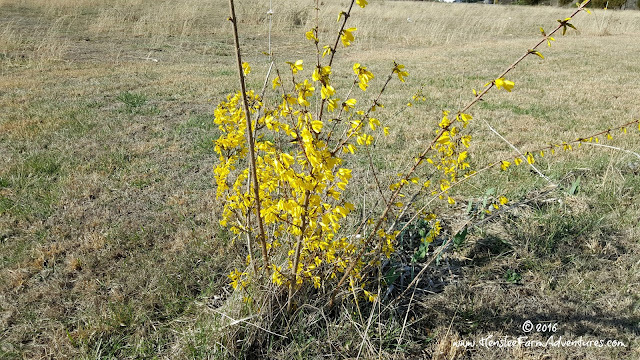 Growing up we always had forsythias. I love their yellow flowers in the spring and lush green leaves in the summer. They are almost always the first thing to bloom letting us know that spring is almost here. I planted this little guy from a small start about 4 years ago. It is slow growing, but it is growing and each year, I get more and more blooms. I just love it! This is one of those pictures that I didn't think was going to turn out, but I was pleasantly surprised. 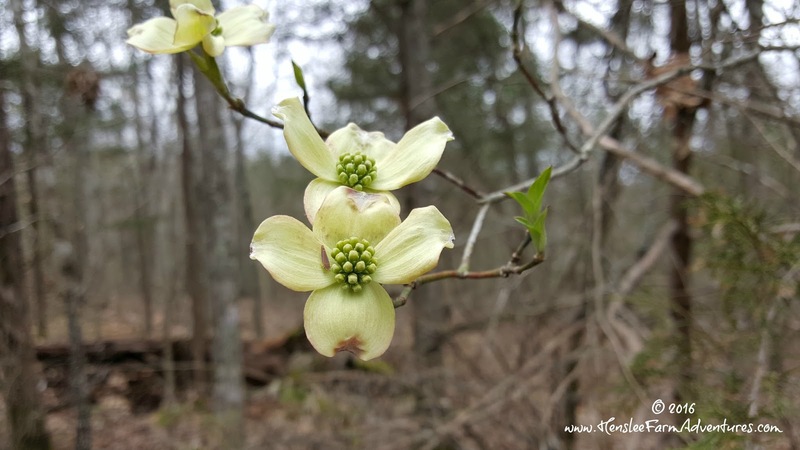 Dogwoods are another one that signifies the start of spring to me. I have tried to grow dogwood trees in my yard, but they don't make it. They need cover, which is why they grow in wooded areas so well. They love the cover of the taller trees. I hope someday to have a pink dogwood tree near my house that I can enjoy. So how are your plants blooming? Do you have a favorite spring flower or tree? Let me know in the comments below!